Ecuador, officially the Republic of Ecuador, is a representative democratic republic in South America, bordered by Colombia on the north, Peru on the east and south, and the Pacific Ocean on the west. The country also includes the Galápagos Islands in the Pacific, about 600 miles (965 km) west of the mainland. Ecuador straddles the equator, from which it takes its name. Its area includes coastline, mountains, and tropical rainforests. Ecuador is a multicultural, multiethnic nation–state with one of the highest representations of indigenous cultures in South America. The dominant populace is descended primarily from Spanish colonists and settlers. Traditionally an agriculture-based economy focused on cocoa and then bananas, the discovery of oil provided a boost that mainly benefited the oligarchy. An economic recession in 1999 led hundreds of thousands of Ecuadorians to emigrate. Political instability also ensued. After eight ineffective presidents in ten years, the frustrated population elected the left-leaning Rafael Correa in 2006, a friend of Venezuela's current president, Hugo Chavez, who promised major governmental and economic reforms to benefit the poor. La Sierra ("the highlands") is the high-altitude belt running north to south along the center of the country, its mountainous terrain dominated by the Andes mountain range. El Oriente ("the east") comprises the Amazon Rainforest areas in the eastern part of the country, accounting for just under half of the country's total surface area, though populated by under 5 percent of the population. The Región Insular is the region comprising the Galápagos Islands, some 620 miles (1,000 km) west of the mainland in the Pacific Ocean. The archipelago consists of more than nineteen islands and islets. Because of its location at the equator, Ecuador does not experience variations in daylight hours during the course of a year. Except for a few minutes resulting from a slight wobble in Earth as it rotates, sunrise and sunset are always at 6:00 a.m. and 6:00 p.m., respectively. Because of its three mainland regions, Ecuador's climate is varied. The Pacific coastal area is tropical, the Andes highlands are temperate, and the eastern side of the mountains shares the jungle climate of the upper Amazon rainforest. Ecuador is a member of Like-Minded Megadiverse Countries, a group of 17 megadiverse countries, with 1,600 bird species (15 percent of the world's known bird species) in the continental area and 38 more endemic to the Galápagos. In addition to 25,000 species of plants, the country has 106 endemic reptiles, 138 endemic amphibians, and 6,000 species of butterfly. Over 20,000 plant species have been recorded in the country. 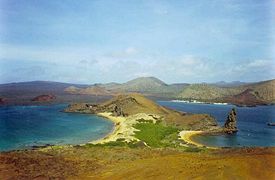 View from Bartolomé Island, Galápagos Islands. Unfortunately, the balance between human needs and nature's has tipped toward the former. In the drive to increase export earnings, tropical rainforests (and the peoples who lived there) were disrupted, if not destroyed, by oil exploitation, and coastal mangrove forests were torn out to make way for shrimp farms. The new industry of growing flowers for export also has its associated ills of high pesticide use and diversion of irrigation water needed by local farmers. In all these areas, the resultant pollution is affecting the health of the people and local flora and fauna. The Galápagos Islands are well known as a region of distinct fauna, famous as the birthplace of Darwin's theory of evolution, and a UNESCO World Heritage Site. Efforts to protect these islands began as early as 1934, when some were set aside as wildlife sanctuaries. In 1959, a national park was created and in 1986, more than 27,000 square miles of ocean surrounding the archipelago was designated a Marine Resources Reserve. An International Whale Sanctuary was established in 1991, in inland waters. Despite being on the UNESCO list, and the various efforts at protection, the islands continue to be endangered by a range of negative environmental effects, threatening the existence of this exotic ecosystem. Evidence of human habitation in Ecuador exists from the Paleoindian period (11,000 to 4,000 B.C.E. ), including the oldest pottery found in the Americas. Cultivation of corn, manioc, pumpkins, and beans began around 6,000 B.C.E. The Valdiva culture flourished along the coast from 4,800 to 1,200 B.C.E. and produced beautiful ceramics. Archaeologists have found ancient trade links between the Valdiva people and those of the highlands and of Central America. Some have speculated that they might be related to the Japanese. Other civilizations that arose throughout Ecuador included the Machalilla culture on the coast; the Tolita (c. 300 B.C.E.–200 C.E. ), who developed a technique for working with platinum hundreds of years before Europeans did; the Quitus (near present-day Quito); and the Cañari (in present-day Cuenca). Each civilization developed its own distinctive architecture, pottery, and religious beliefs. After years of fierce resistance the Cañari fell to the Incan expansion and were assimilated loosely into the Incan empire in the fifteenth century. In 1531, the Spanish conquistadors, under Francisco Pizarro, arrived to find an Inca empire torn by civil war and subdued it. In subsequent years, the Spanish colonists became the new elite, centering their power in the vice-royalties of Nueva Granada and Lima. The indigenous population of Ecuador (estimated to be between 750,000 and 1,000,000) was decimated by disease during the first decades of Spanish rule—a time when the natives were forced into the encomienda labor system for Spanish landlords. 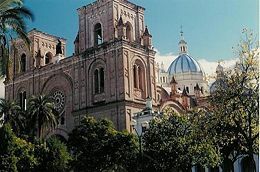 In 1563, Quito became the seat of a royal audiencia (administrative district) of Spain and part of the Vice-Royalty of Lima, and later of the Vice-Royalty of Nueva Granada. After nearly three hundred years of Spanish colonization, Quito was a city of ten thousand inhabitants. It was there, on August 10, 1809 (the national holiday), that the first call for independence from Spain was made in Latin America, under the leadership of the city's criollos. Quito's nickname, "Luz de América" ("Light of America"), comes from the idea that this first attempt created a domino effect that would ultimately lead to the expulsion of Spain from the continent. View of Old Quito, one of the highest cities in the world. 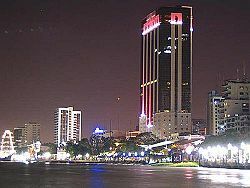 On October 9, 1820, Guayaquil became the first city in Ecuador to gain its independence from Spain. It was not until May 24, 1822, that the rest of Ecuador gained its independence. Ecuador joined Simón Bolívar's Republic of Gran Colombia, only to become a separate republic in 1830. The nineteenth century was marked by instability, with a rapid succession of rulers. The first president was the Venezuelan-born Juan José Flores, who was ultimately deposed, to be followed by many authoritarian leaders. The conservative Gabriel Garcia Moreno unified the country in the 1860s with the support of the Roman Catholic Church. World demand for cocoa tied the economy to commodity exports and led to migrations from the highlands to the agricultural area on the coast. A coastal-based liberal revolution, in 1895, reduced the power of the clergy and the conservative landowners of the highlands, and this liberal wing retained power until the military "Julian Revolution" of 1925. The 1930s and 1940s were marked by instability and the emergence of populist politicians such as five-time president José María Velasco Ibarra. The struggle for control over territory in the Amazon basin led to a long-lasting dispute between Ecuador and Peru. In 1941, war broke out between the two countries. Peru claimed that Ecuador's military presence in Peruvian-claimed territory was an invasion; Ecuador, for its part, claimed that Peru had invaded Ecuador. Eventually, Peru gained control over all the disputed territory. The Peruvian navy blocked the port of Guayaquil, cutting supplies to the Ecuadorian troops. After a few weeks of war, and under pressure by the United States and several Latin American nations, all fighting stopped. Ecuador and Peru reached an accord, formalized in the Rio Protocol, in favor of hemispheric unity against the Axis powers in World War II. As a result of its victory, Peru was awarded the disputed territory. It would take two more undeclared wars before a peace agreement was finally reached in 1999, to end hostilities. Recession and popular unrest led to a return to populist politics and domestic military interventions in the 1960s, while foreign companies developed oil resources in the Ecuadorian Amazon. In 1972, construction of the Andean pipeline was completed. The pipeline brought oil from the east side of the Andes to the coast, making Ecuador the second-largest oil exporter in South America. That same year, a "revolutionary and nationalist" military junta overthrew the government and remained in power until 1979, when elections were held under a new constitution. Jaime Roldós Aguilera was elected president, governing until May 24, 1981, when he died in a plane crash. By 1982, the government of Osvaldo Hurtado faced an economic crisis, characterized by high inflation, budget deficits, a falling currency, mounting debt service, and uncompetitive industries, leading to chronic government instability. Many years of mismanagement, starting with the mishandling of the country's debt during the 1970s military regime, had left the country essentially ungovernable. Since the mid-1990s, the government of Ecuador has been characterized by a weak executive branch that struggles to appease the ruling classes represented in the legislative and judiciary. The three democratically elected presidents during the period 1996–2006 all failed to finish their terms. The emergence of the indigenous population (about 25 percent) as an active constituency has added to the democratic volatility of the country in recent years. The population has been motivated by government failures to deliver on promises of land reform, lower unemployment, and provision of social services, as well as historical exploitation by the land-holding elite. Their movement, along with the continuing destabilizing efforts by both the elite and leftist movements, have led to a deterioration of the executive office. The populace and the other branches of government give the president very little political capital. In April 2005, for example, Ecuador's congress ousted President Lucio Gutiérrez. The vice president, Alfredo Palacio, took his place and remained in office until the presidential election of 2006, which did not produce a conclusive winner until a runoff election elected Rafael Correa. 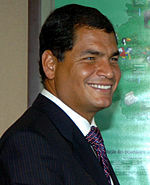 Current president of Ecuador, Rafael Correa. The constitution provides for concurrent four-year terms for the president, vice president, and members of Congress. Presidents may be reelected after an intervening term, while legislators may be reelected immediately. The executive branch includes 15 ministries. Provincial governors and councilors (mayors, aldermen, and parish boards) are directly elected. Justices of the Supreme Court are appointed by the Congress for indefinite terms. On September 30, 2007, Ecuador elected a constituent assembly, dominated by President Rafael Correa's PAIS Alliance, charged with rewriting the constitution. Ecuador's political parties have historically been small, loose organizations that depend more on populist, often charismatic, leaders to retain support than on programs or ideology. Frequent internal splits have produced great factionalism. No party has won the presidency more than once through elections since the return to civilian government in 1979. Although Ecuador's political elite is highly factionalized along regional, ideological, and personal lines, desire for consensus on major issues often leads to compromise. Opposition forces in Congress are loosely organized, but historically they often unite to block the administration's initiatives. Beginning with the 1996 election, the indigenous population abandoned its traditional policy of shunning the official political system and participated actively. The indigenous population established itself as a force in Ecuadorian politics, and participated in the Gutiérrez administration before joining the opposition. In the 2006 elections, the indigenous movement won six seats in Congress (down from 11 in 2002). Constitutional changes enacted by the specially elected National Constitutional Assembly in 1998 took effect on August 10, 1998. The new constitution strengthened the executive branch by eliminating mid-term congressional elections and by circumscribing Congress' power to remove cabinet ministers. Party discipline varies, and many congressional deputies switch allegiance during each Congress. On April 15, 2007, 82 percent of voters approved a referendum to convene a constituent assembly, a centerpiece of President Correa's political reform agenda. This will be Ecuador's seventh such assembly in the past ninety years, and, if successful, will produce Ecuador's twentieth constitution since independence. Ecuador is divided into 24 provinces, each with its own administrative capital. The provinces are divided into 199 cantons and subdivided into parishes. Ecuador has often placed great emphasis on multilateral approaches to international issues. Ecuador is a member of the United Nations (and most of its specialized agencies) and many regional groups, including the Rio Group, the Latin American Economic System, the Latin American Energy Organization, the Latin American Integration Association, and the Andean Pact. The ongoing conflict in Colombia and security along the 450-mile-long northern border are important issues in Ecuador's foreign relations with Colombia. The instability of border areas and frequent encroachments of Colombian guerrillas into Ecuadorian territory have led the Ecuadorian army to deploy more troops to the region. Although Ecuadorian officials have stated that Colombian guerrilla activity will not be tolerated on the Ecuadorian side of the border, guerrilla bands have been known to intimidate the local population, demanding extortion payments and practicing vigilante justice. The close proximity of the border to northern oil fields has resulted in kidnappings of foreign oil workers by Colombian-based criminals. The Correa administration is pursuing a policy known as Plan Ecuador to develop the northern border region and protect citizens from the drug threat. Ecuador and the United States agreed in 1999 to a ten-year arrangement whereby U.S. military surveillance aircraft could use the airbase at Manta, Ecuador, as a Forward Operating Location to detect drug trafficking flights through the region. President Correa has stated that he will not renew the lease. Correa is allied with Venezuelan President Hugo Chavez and Bolivia's Evo Morales, who share his populist, left-wing views, part of a growing trend in Latin America that rejects the free market policies of the 1990s in favor of policies aimed at redressing social and economic inequalities. Organized illegal narcotics operations in Colombia penetrate across Ecuador's shared border, which thousands of Colombians also cross to escape the violence in their home country. Ecuador is also a significant transit country for cocaine originating in Colombia and Peru, with over half of the U.S.-bound cocaine passing through Ecuadorian Pacific waters. It is an importer of precursor chemicals used in the production of illicit narcotics and an attractive location for cash-placement by drug traffickers laundering money because of dollarization and a weak anti-money laundering regime. The Ecuadorian economy is based on petroleum production, manufacturing primarily for the domestic market, and agricultural production for domestic consumption and export. In 2006, oil accounted for 59 percent of total export earnings. Ecuador is the world's largest exporter of bananas (about $1.2 billion in 2006) and a major exporter of shrimp ($588 million in 2006). Exports of nontraditional products such as flowers ($436 million in 2006, a threefold increase in 10 years) and canned fish ($575 million in 2006) have grown in recent years. Ecuador's economic performance has been solid since it adopted the U.S. dollar as its national currency in 2000, following a major banking crisis and recession in 1999. Since 2000, growth has averaged over 5 percent per year. This performance has taken place despite political turbulence, thanks to the stability brought by dollarization, high oil prices, strong domestic consumer demand, and growing remittances (over $2.5 billion a year) from Ecuadorians living abroad. Per capita income increased from $1,296 in 2000 to an estimated $3,088 in 2006, while the poverty rate fell from 51 percent in 2000 to 38 percent in 2006. Though Ecuador has a relative abundance of oil reserves, it has been unable to take full advantage of those resources for its own development. Mismanagement, lack of investment, and corruption in the state-owned oil sector have caused declines in state oil production over the last decade. Overall oil production increased during that period because of growing production by private sector companies, but in the first half of 2007, production by the state oil company fell, while that by private sector companies was flat. Commercial disputes as well as judicial and contractual uncertainties have deterred private oil and other companies from investing in the country. Ecuador was in the final stages of negotiating a free trade agreement (FTA) with the United States, but that progress stalled with an April 2006 hydrocarbons law mandating revisions in contract terms and the May 2006 seizure of the assets of Occidental Petroleum, at the time the country's largest U.S. investor. President Correa has announced his opposition to resumption of FTA talks with the United States, citing concerns that Ecuador is not yet sufficiently competitive, especially in sensitive agriculture sectors. Prior to taking office, he said that the government of Ecuador would only service its external debt obligations after funding domestic social priorities; as of September 2007, the government had met its external debt obligations. The government increased income transfers to the poor and has increased spending on health, education, and basic infrastructure. The United States is Ecuador's principal trading partner. In 2006, Ecuador exported about $6.7 billion in products to the United States. For over 10 years Ecuador has benefited from duty-free entry for certain of its exports under the Andean Trade Preferences Act (ATPA) and received additional trade benefits under the Andean Trade Promotion and Drug Eradication Act (ATPDEA) in 2002. The U.S. Congress approved an eight-month extension of those benefits, now set to expire on February 29, 2008. In April 2007, after winning a referendum on constitutional reform, President Correa announced that he no longer intended for the country to make repayments to the International Monetary Fund or deal with the World Bank. 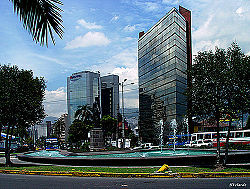 More than half the population lives in cities, with regional rivalries between Quito, the center of government, and Guayaquil, the largest city and economic hub. Ecuador's population is ethnically diverse. The largest ethnic group is the mestizos, mixed descendants of Spanish colonists and indigenous Indians, who constitute 65 percent of the population. Amerindians, criollos, the unmixed descendants of early Spanish colonists, as well as immigrants from other European nations are second, accounting for 25 percent of the population. Whites account for about 7 percent. The small Afro-Ecuadorian minority, including mulattos and zambos, largely based in the Esmeraldas and Imbabura provinces, makes up 3 percent. There are sizable expatriate Ecuadorian communities in Spain and Italy, as well across Europe, the United States, Canada, and Japan. It is estimated that 700,000 people emigrated from Ecuador following the 1999 economic crisis, and that the expatriate Ecuadorian population totals 2.5 million. The tropical forest region to the east of the mountains (El Oriente) remains sparsely populated and contains only about 3 percent of the population. The public education system is free and attendance is mandatory from ages five to fourteen. Provision of public schools falls far below the levels needed, and class sizes are often very large. The Ministry of Education reports that only 76 percent of children finish six years of schooling. In rural areas, only 10 percent of the children go on to high school. Ecuador has 61 universities, many of which offer graduate degrees. About 300 higher institutes offer two to three years of post-secondary vocational or technical training. Ecuador's mainstream culture is defined by its mestizo majority and, like their ancestry, is a mixture of European and Amerindian influences infused with African elements inherited from slave ancestors. Ecuador's indigenous communities are integrated into that mainstream culture to varying degrees, but some may also practice their own autochthonous cultures, particularly the more remote indigenous communities of the Amazon basin. The Panama hat is of Ecuadorian origin and is known there as "Sombrero de paja toquilla." Its manufacture (particularly that of the Montecristi superfino) is considered a great craft. Notable people born in Ecuador include painters Tábara, Guayasamín, Kingman, Rendón, Arauz, Constanté, Viteri, Molinari, Maldonado, Gutierrez, Endara Crow, Villacís, Egas, Villafuerte and Faini; animator Mike Judge; poet and statesman José Joaquín de Olmedo, scholar Benjamín Urrutia, and tennis player Pancho Segura. Approximately 95 percent of Ecuadorians are Roman Catholic. In the rural parts of Ecuador, indigenous beliefs and Christianity are sometimes syncretized. There is also a growing number of Mormon and Protestant denominations. Most festivals and annual parades are based on religious celebrations. There is a small Muslim minority numbering in the low thousands. The Jewish community numbers just over a thousand and is mostly of German and Italian origin. There are also Sephardic Jews (Judeo-Spanish Jews). The most popular sport in Ecuador, as in most South American countries, is soccer (football). The matches of the Ecuadorian national football team are the most-watched sports events in the country. In June 2007, FIFA adopted a resolution prohibiting international football games at or higher than 2,500 meters above sea level. Rafael Correa and his presidential counterparts in Peru, Bolivia, and Colombia issued a joint letter of protest against this ruling. Ecuador qualified for the final rounds of both the 2002 and 2006 FIFA World Cups. Ecuador finished ahead of Poland and Costa Rica to come in second to Germany in Group A in the 2006 World Cup. Futsal, often referred to as índor (indoor soccer), is particularly popular for mass participation. There is considerable interest in tennis in the middle and upper classes of Ecuadorian society, and several Ecuadorian professional players have attained considerable international fame. Basketball also has a high profile, while Ecuador's specialties include Ecuavolley, a three-person variation of volleyball. Bullfighting is practiced at a professional level in Quito, during the annual festivities that commemorate the Spanish founding of the city. Bullfighting is found in smaller towns, notably El Chaco (east of Quito). Ecuador obtained its first Olympic gold medal in Atlanta's 1996 Olympic Games, through Jefferson Pérez, on the 20 km race-walk. There is flourishing activity in nontraditional sports such as mountain biking, motorbiking, surfing, and paintball. Since 2005, Ecuador has held the Guayaquil Marathon, which is an international foot race. 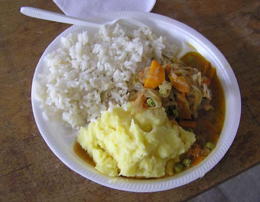 The food in Ecuador is diverse, varying with altitude and associated agricultural conditions. Pork, chicken, beef, and “cuy” (guinea pig) are popular in the mountain regions and are served with a variety of grains (especially rice and corn) or potatoes. A popular street food in mountain regions of Ecuador consists of potatoes served with roasted pig (hornado). Fanesca, a fish soup including several types of bean, is often eaten during Lent. During the week before Halloween, the fruit beverage Colada Morada is drunk hot, accompanied by Guaguas de Pan, stuffed bread shaped like children. A wide variety of fresh fruit is available, particularly at lower altitudes, including granadilla, passion fruit, naranjilla, several types of bananas, uvilla, taxo, and tree tomato. Seafood is popular at the coast, where prawns, shrimp, and lobster are key parts of the diet. Plantain and peanut based dishes are the basis of most coastal meals, which are usually served in two courses. The first course is caldo soup, which may be aguado (a thin soup, usually with meat) or caldo de leche, a cream vegetable soup. The second course might include rice, a little meat or fish with a menestra (stew), and salad or vegetables. Patacones are popular side dishes with coastal meals. Some of the typical dishes in the coastal region are: Ceviche, pan de almidón, corviche, guatita, encebollado, and empanadas; in the mountain region: hornado, fritada, humitas, tamales, llapingachos, lomo saltado, and churrasco. In the rainforest, a dietary staple is the yucca, elsewhere called cassava. The starchy root is peeled and boiled, fried, or used in a variety of other dishes. Many fruits are available in this region, including bananas, tree grapes, and peach palms. Aguardiente, a licorice-flavored spirit, is probably the most popular national alcohol. Drinkable yogurt, available in many fruit flavors, is extremely popular and is often consumed with pan de yucca, which is a light bread filled with cheese and eaten warm. Museum of Anthropology and Contemporary Art, near the breakwater in Guayaquil. There are many contemporary Ecuadorian writers, including the novelist Jorge Enrique Adoum; the poet Jorge Carrera Andrade; the essayist Benjamín Carrión; the poet Fanny Carrión de Fierro; the novelist Enrique Gil Gilbert; the novelist Jorge Icaza (author of the novel Huasipungo, translated into many languages); the short story author Pablo Palacio; the novelist Alicia Yanez Cossio; the prominent author and essayist Juan Montalvo, and U.S.-based, half-Ecuadorian poet Emanuel Xavier. Ecuador has produced many world-renowned master painters including: Oswaldo Guayasamín, Camilo Egas, and Eduardo Kingman from the Indiginist Movement; and Manuel Rendon, Enrique Tábara, Aníbal Villacís, and Estuardo Maldonado from the Informalist Movement. Ecuador has a network of national highways. 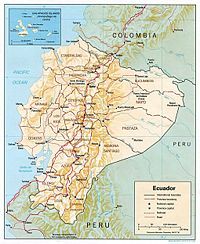 The Pan-American Highway connects the northern and southern portions of the country as well as connecting Ecuador with Colombia to the north and Peru to the south. The quality of roads, even on truck routes, is highly variable. An extensive network of intercity buses uses these mountain roads and highways. ↑ 1.0 1.1 Central Intelligence Agency, Ecuador The World Factbook. Retrieved December 26, 2011. ↑ Ecuador MW.com. Retrieved December 26, 2011. ↑ 3.0 3.1 3.2 3.3 Ecuador. International Monetary Fund. Retrieved December 26, 2011. ↑ Gini Index. World Bank. Retrieved December 26, 2011. ↑ Michael D. Lemonick, Can the Galapagos Survive? Time, October 30, 1995. Retrieved January 21, 2008. ↑ Gobierno Nacional de la Republica Del Ecuador, Ecuador, Bolivia, Perú y Colombia rechazan la prohibición de partidos internacionales de fútbol en ciudades situadas a más de 2.500 metros de altitud. Retrieved January 21, 2008. Bureau of Western Hemisphere Affairs. Background Notes: Ecuador. U.S. Department of State. Retrieved January 21, 2008. Countries and their Cultures. Culture of Ecuador. Retrieved January 21, 2008. Foley, Erin L., and Leslie Jermyn. 2006. Ecuador. New York: Marshall Cavendish. ISBN 0761420509. Smith, Julian. 2005. Ecuador, 3rd edition. Emeryville, CA: Avalon Travel Publishing. ISBN 1566916100. Tidwell, Mike. 1996. Amazon Stranger: A Rainforest Chief Battles Big Oil. New York: Lyons & Burford Publishers. ISBN 1558214062. This page was last modified on 25 September 2017, at 22:18.